A new school year is right around the corner and it’s time to start preparing your kids (and yourself) for the inevitable end of summer vacation. The more organized you are leading up to the big day, the less stressful it will be for the entire family once it arrives. Check out our school year prep checklist below. 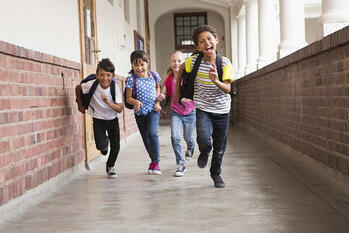 Before the hectic schedule of school kicks in, schedule doctor and dentist appointments for your children. Not only will it will be easier to find an appointment time that works for you, but many schools require well visits/immunizations before the school year starts. This is also a great time to schedule that much needed hair cut. Picture day will be here before you know it! The beginning of a new school year means new supplies, but before heading out to the store, check your closets and drawers for unused supplies from previous years. You may also want to wait and see if teachers send home a supplies list within the first few days to avoid multiple shopping trips. If they are old enough, sit down with your child and create a budget before going shopping. Some kids may feel a bit of anxiety leading up to a new year of school and a great way to combat this is to visit their school. Even if it’s the same school they attended the previous year, locating their new classroom and meeting their teacher (if possible) is a great way to lessen their worries. If you have a child entering middle or high school, this gives them the chance to find their way around easing those ‘I won’t be able to find my classes’ concerns. If your child is taking the bus for the first time, get a copy of the route and drive it with your child, helping your child learn the routine. Summer always seems to end a little earlier each year. Plan some fun activities as a last hurrah leading up to the end of vacation. Some fun ideas include the planetarium, museums, Hogle Zoo, Living Planet Aquarium, a Bees game, the park, hikes, a picnic, or even a mini-staycation. No matter your budget, you’re bound to find something that’s fun for the entire family.